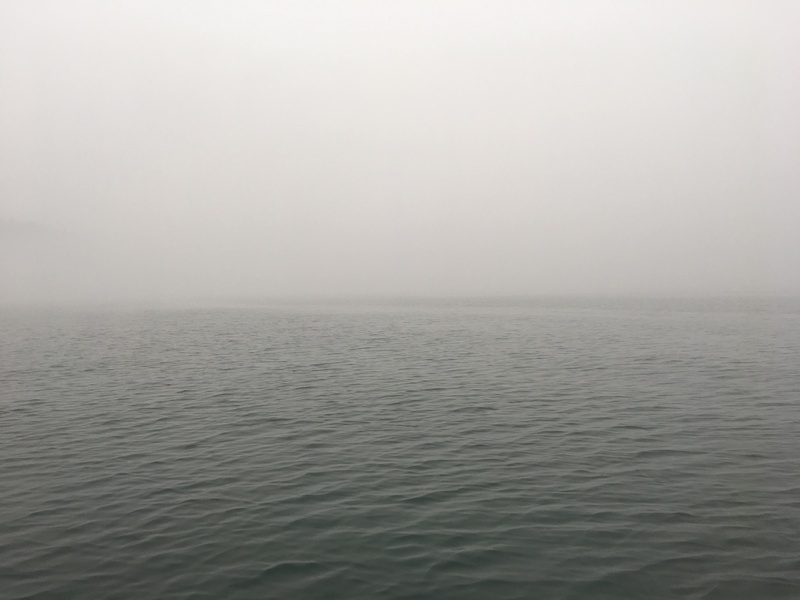 We have zero visibility as we pull away from the slip in Port McNeil and enter Queen Charlotte Strait. Checkout time is 11 am and we must leave as they have another boat coming into our slip. The dock master assures us that the fog usually lifts by 10 am, but not today. We keep hoping for conditions to improve but visibility remains at 100 yards. Today there is a combination of fog and smoke. There are over 35 forrest fires burning on Vancouver Island due to the dry conditions. However, the fog doesn’t deter the fishing boats. We have boats coming and going every which way. Our fog horn announces our position every 2 minutes while we listen in amazement to boats on the VHF who are lost with no radar or chart plotters. Several resort to following friends in the thick fog. We both monitor the radar in horror as several small boats proceed towards us without slowing. As Jeff is blasting our horn, a boat appears 100 yards off our bow. They seem oblivious to our position and continue on their way trolling their fishing lines behind. Forty miles in the fog makes for a stressful day in the pilot house. Luckily, the fog lifts before reaching our anchorage at Potts Lagoon. With the anchor down in this beautiful cove, we can now relax. Although we are used to traveling in the fog, we vow to never travel these busy fishing waters in these extreme conditions again. 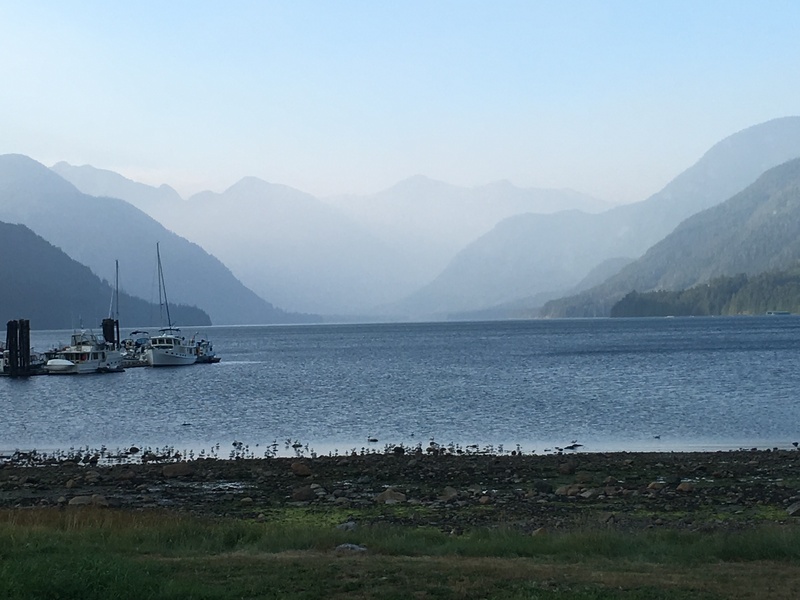 We chose this anchorage because of a tip from another boater about good prawning. We set two traps in about three hundred feet of water hoping for shrimp. Jeff is skeptical after hauling traps many times before with little return. Most boaters have electric pot haulers. Our pot hauler is Jeff’s left and right arm and 300 feet is a long way down. 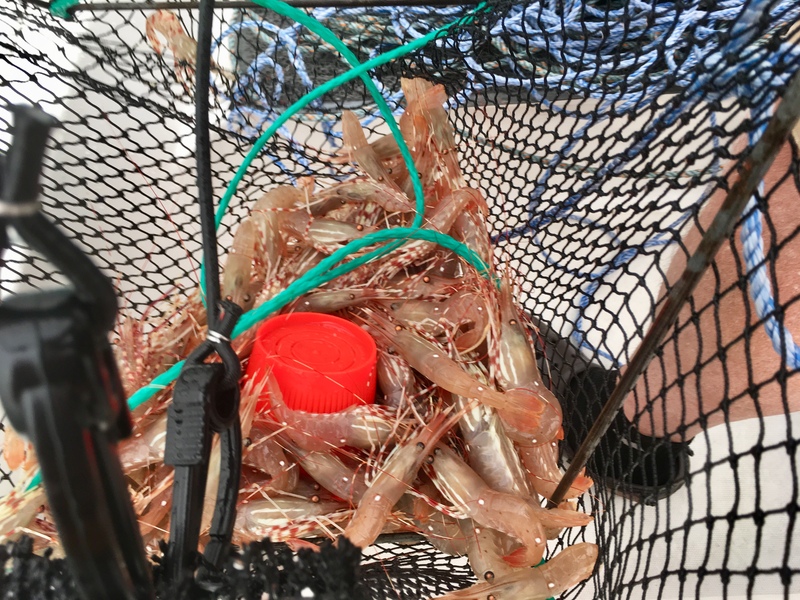 Eight hours later, we pull our first trap happy to find about 30 shrimp inside. Jeff is smiling as he hauls our second trap out of the water. It is loaded with beautiful B.C. Spot prawns. 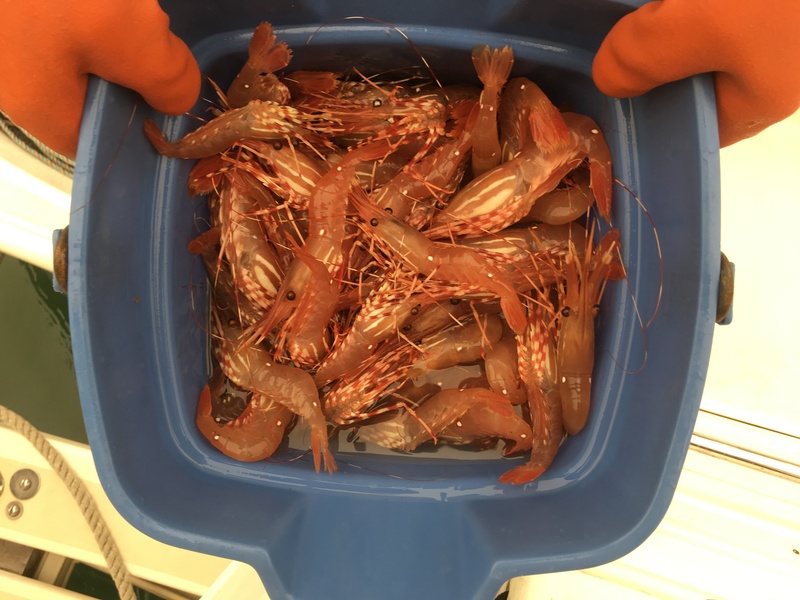 We have a bucket full of these delicious sweet crustaceans. 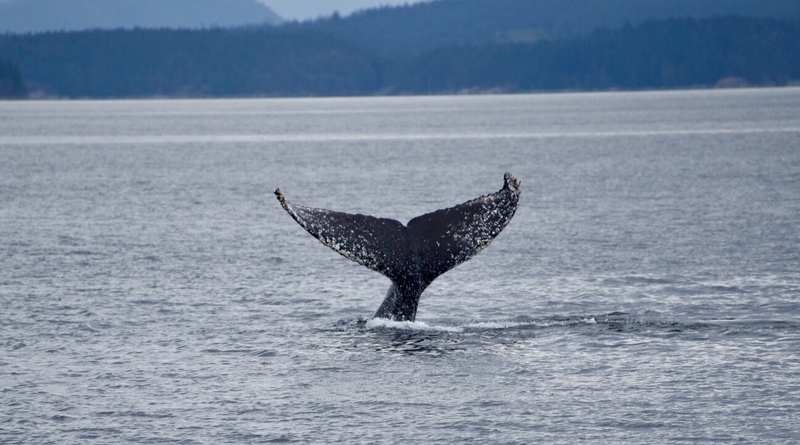 We are away from the anchorage early the next morning for our travel down Johnstone Strait. The winds are forecast to pick up this afternoon and the Strait can get quite ugly in high winds. It is already blowing 15 to 20 knots but luckily both the current and winds are going the same direction as us and the seas are not too bad. Reaching Sunderland Channel four hours later, we are happy to get off Johnston Strait as the seas are now 3-4 feet and building. We have five rapids to navigate over the next two days as we work our way into Desolation Sound. Several of these rapids must be traversed at only slack. Using our Ports and Passes tide book, we spend a lot of time calculating the currents at each rapid and plan our trip to arrive at the correct times. The rapids are impassable at other times with up to 12 knots of current and gigantic whirlpools that have sunk boats. Whirlpool and Green Point rapids are our first two rapids. Being 12 miles apart, it is impossible to reach both at slack tide. Following the advice of Tom and Jan on Sun Chaser, we arrive to Whirlpool Rapids one and a half hours before slack. By doing so, we will arrive at Green Point Rapids at slack. 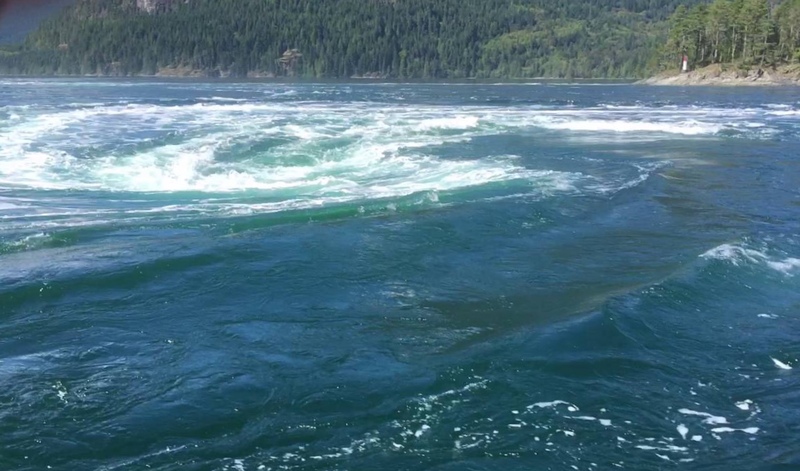 Whirlpool poses less danger than the other rapids so it can be traversed early. We have run this rapid before, but only at slack so are a little nervous about this passage. We find two knots of current and several small whirlpools in the rapids, but are soon blasted through and on our way. Arriving at Green Point rapids at slack we find very little turbulence and have an easy transit. As we pass Shoal Bay, we spot one empty space on the Government dock. Our plans to anchor in Cameleon Harbor are quickly changed and we are soon tied to the sturdy wharf. 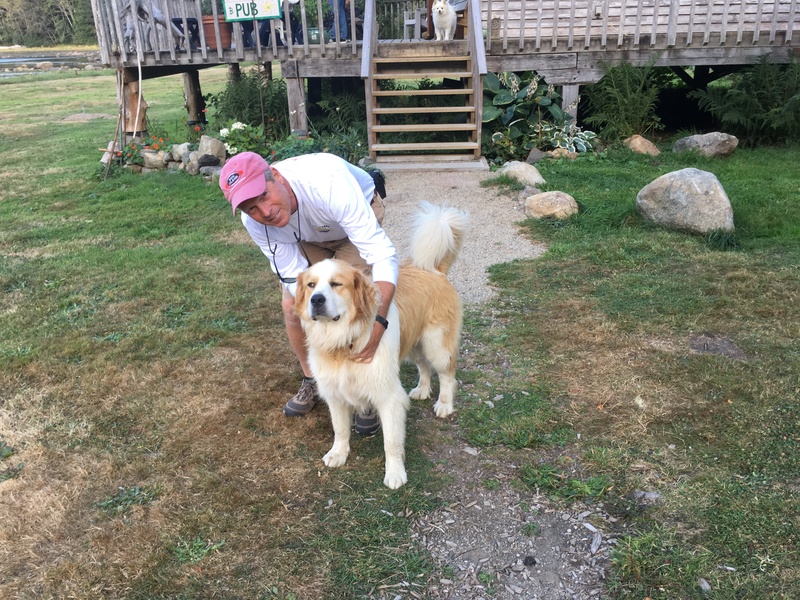 Mark and Cynthia, who live on 200 acres surrounding the bay, are the harbor masters. They have opened up a small pub just up the hill that serves draft beer, wine, and a few other drinks to visiting boaters. The view from the pub of the surrounding mainland fjords is stunning. 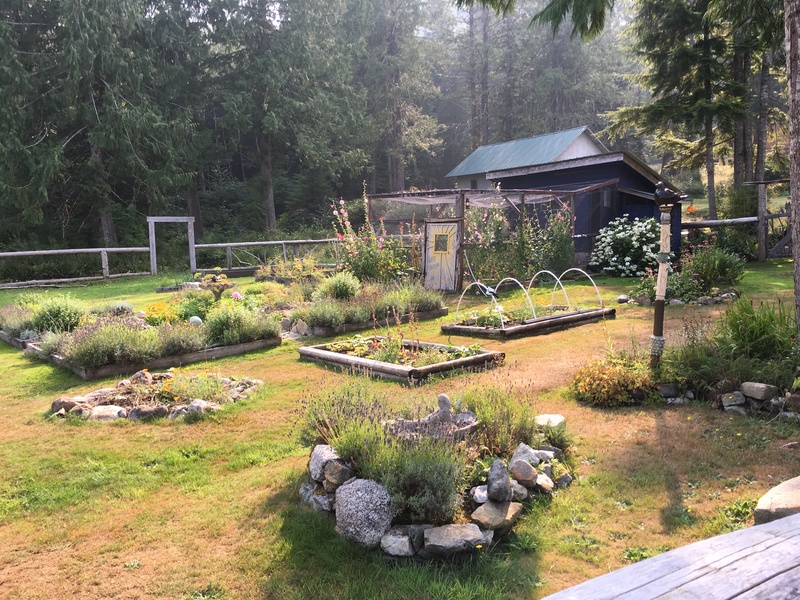 Cynthia graciously opens up her garden to visitors to harvest vegetables and herbs for a small donation. A well disguised trail leads us on a two mile hike 1000 feet up one of the mountains to an old gold mine. 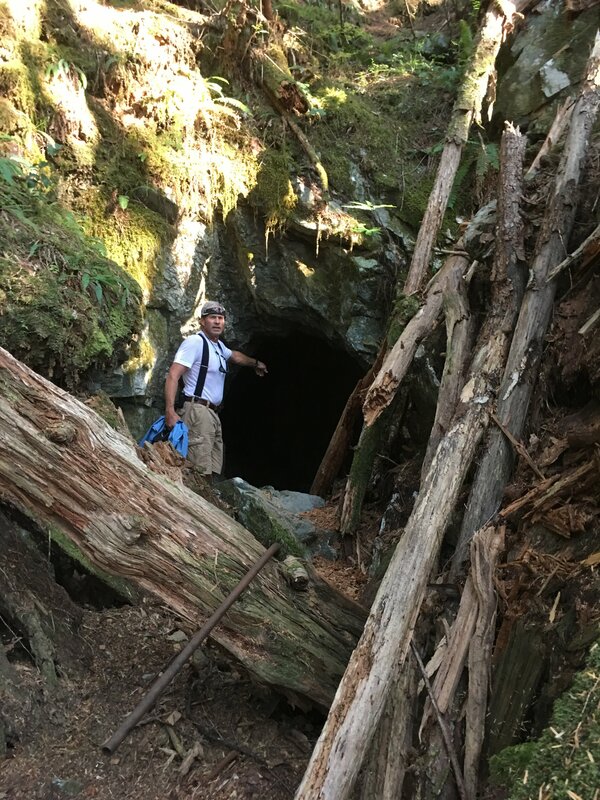 Jeff starts to explore the mine shaft but soon discovers large holes in the floor dropping away in the darkness and prudently retreats back to the daylight. We befriend Tulip, the Shoal Bay mascot. 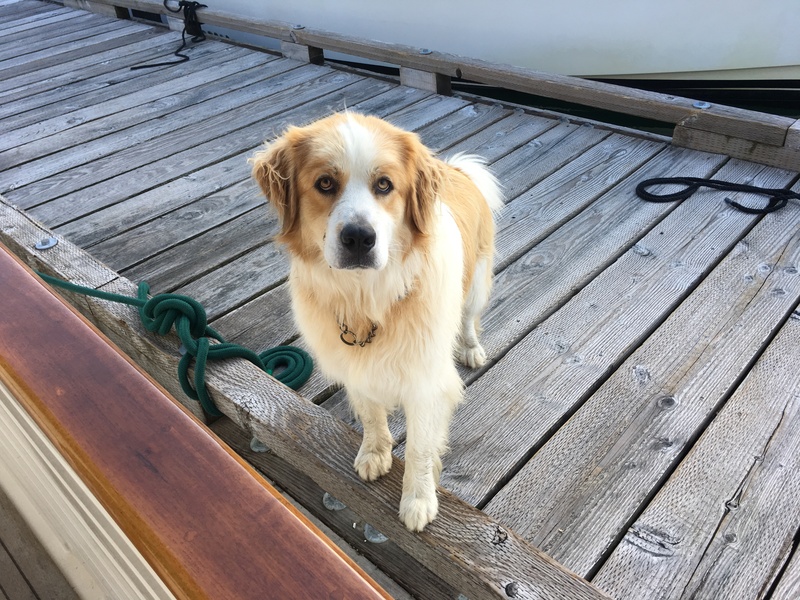 After giving her several treats, she follows us back to the boat where she parks herself for several hours hoping for more goodies. Jeff finally walks her back up the hill to her owners. We time our departure from Shoal Bay as we have the three most dangerous rapids of our trip to navigate. The Dent, Gillard, and Yuculta rapids are legendary for their dangerous currents and whirlpools. Several years ago a large seiner capsized in the Devils Hole at Dent rapids and all four crew members perished. You MUST transit this rapid within only a few minutes of slack. We arrive precisely at slack and still find swirling waters that turn the boat from side to side. I can’t imagine going through here any other time. This is what the Devils Hole looks like when the current is running. Within a few miles, we are at Gillard and Yuculta also at slack. We again have a calm passage as our timing is to the minute. We are glad to have these three rapids behind us. 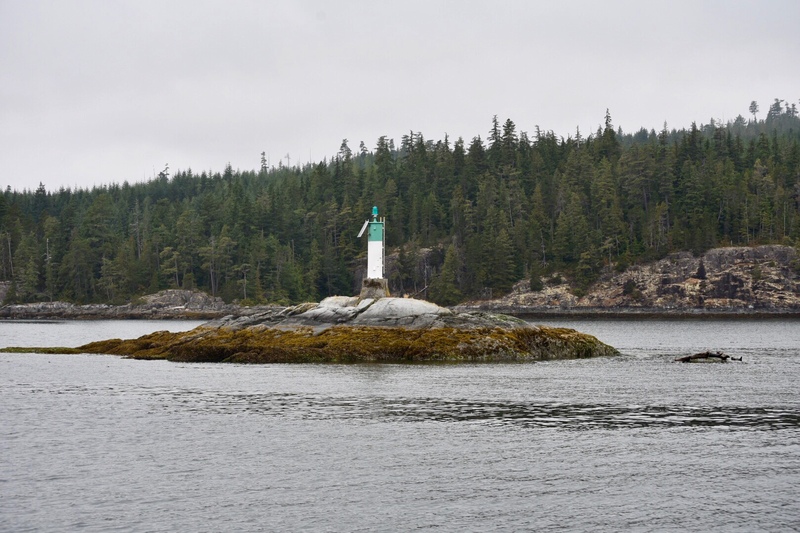 As we enter Desolation Sound, Rekindle shows up on our AIS just a few miles ahead. We soon catch up to them as we are both heading to Van Donop anchorage. We are also happy to see Lynn and Neil on Navigator, another 48 Krogen, also here in the anchorage. We look forward to spending the next few days hiking, kayaking and chatting with our Krogen friends. This entry was posted on September 30, 2018 at 11:50 pm. You can follow any responses to this entry through the RSS 2.0 feed. You can leave a response, or trackback from your own site.